This one is for all you food nuts out there – you know who your are Jenny and Kimberley – how do corn chips come in three different colours?! Now before you say food colouring I have already checked that and even the organic corn chips with no added flavours or colours come in this vibrant red and greeny blue colour. When you have the answer post a comment – I will pick up a special souvenier for the first person to give me the explanation. 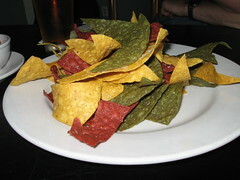 These tri colour corn chips were not a one off either, they are what most establishments serve. More on food, Mums and Dads relax we have been eating well. Groceries here are fairly well priced and like Sydney if you hit China Town you can pick up some great stuff. Simon whipped up a pretty good chilli con carne the other night and we had it for lunch again the next day – this did our budget the world of good. Therefore here is the second food task of the day – we need some more recipes like this. The main criteria is that ther require few ingredients and they are relativly easy to whip up in a busy hostel kitchen. My other note on food, or more so shopping for food, is on the Choice Supermarket in Vancouver. This is gluten free shopping heaven. The store is an organic supermarket but on all the shelves the gluten free products are marked with a blue tag – this made my life about ten times easier. In fact supermarkets in Canada are generally shopper friendly. NIce wide aisles, soft lighting, dark timber fixtures and all have a little coffee shop in the front. The Marketplace, a supermarket in downtown Vancouver was so comfortable we had our breakfast there – also it was $2 for a muffin and coffee – can’t really beat that. Anyways, look forward to the recipes. I will pop a couple of reviews up from time to time. Hello Gem and Simon, I am pleased you are eating well, and what a interesting display of corn chips. My answer to the quiz would be they are coloured with capsicums, seaweed or spinach. The same way they colur pasta. Speaking of which is a great idea for a substanial and long keeping dish for you to make. 1 cup macaroni uncooked – 1 chopped onion – 500gm good mince – packet beef & veg soup (dry) – 1 can crushed tomato. Add your own herbs and spices if you wish. mix all together – put in a loaf tin and bake at 180 deg for 40 min to 1 hour. Great cheap hot baked dinner and left overs sliced for sandwiches. Soups are alway great to use as a base- usually cheaper than prepared sauces. Debbies answer is much too sensible – I have two possibilites – the water in Canada is natuarally halucinogenic or Simon has photoshopped the corn chips and this is all a case of digital mischief! Next time you go bikeriding Gem you might need more protective padding for the saddle and less for the head. Glad to hear you are going well and eating sensibly. I will consult the other half for a recipe, but Simo probably knows most of hers. well as the corn chips question…. logical! corn chips …. mexican! mexicans eat …. spinach, red kidney beans and ofcourse corn! and the 2nd, cheap food ideas….. find a soup kitchen or follow the girl guides! Really happy all is above expected! I always thought that gluten free was merely yet another capitalist marketing ploy. I find that some Campbell’s Condensed Soup – Tomato of course – is always convenient when hostel dwelling. Just make sure you use milk (but definitely NOT Lite White), and not water. Undoubtedly the Canadian supermarkets have loads of A2. Also, seal flipper pie is an apparently highly prized dish up there. Just don’t try the Fray Bentos version. Isn’t that V I Lenin just an attention seeking trainspotter at heart? No, really? He predictably resorts to cheap humour (ice picks, how original) when he’s out of his very shallow depth. No doubt he’ll be spouting the virtues of dialectical materialism next. My pick is that that the red and green are coloured by capiciums, with the yellow being the natural corn colour. Comrade Trotsky – can you please keep your (side) splitting tendancies in check! Honestly, if trying to keep abreast of developments in the state’s key infrastructures such as rail and having respect for cute baby seals is shallow, then I shall remain so. And your recipe? Nothing more than rampant project mongering! Plain Flour, baking powder, sugar chocolate chips, butter, cocoa powder and a special ingredient which I think you made need to acquire from the lovely sounding old gent you bumped into in Ketchikan (?). From the description of these brownies in my compendium they sound like they’d go down a treat amoungst the carefree souls staying at a youth hostel and will definately win friends – in fact I think my compendium was written by someone living in a hostel as it also included recipes mainly for baked beans, porridge, tinned soup, pasta and 101 ways with a free breakfast of tea & toast. So my adventurous friends I hope this has helped you and I hope I can continue to assist with your culinary needs throughout your journey in deepest Canada PS: Do you have any details on 2 posters going by the names of VI and Leon? They do sound most enthralling characters and I would love to sit down and take a high tea with them – it is so hard to meet ones contempories that are of a good character these days. Well all – no correct answers here – the answer is that there is red and blue corn! I have checked various brands of corn chips and they all say made using blue corn or made using red corn – You can even buy the different colours in seperate bags. Blue corn or maize (Zea mays L.) is an open pollinated flour corn and contains soft starch useful in the milling of specialty foods. Currently, these foods include tortillas, pancake mixes, cornbread mixes, corn chips, and cereal. Experimental extrusion of blue corn has been successful, and extruded blue corn products are now being marketed (Arrowhead Mills pers. commun.). Studies at Colorado State University indicate that the protein content of commercial blue corn is consistantly 30% higher than dent corns in adjacent fields (Johnson and Croissant 1990). Consumption and sales of blue corn is increasing (Fig. 1). The market is in Mexican restaurants, health food stores, and some supermarkets. The term “blue corn” is a generic term with plants producing blue and mixtures of blue and white kernels. Bluecorn sales continue to show growth as shown in Fig. 2. As for the recipes – some good suggestions – but remember Gluten Free. I am going to buy the Canadian version of Family Circle/Better Homes and Gardens and Good Housekeeping – I’m missing my Mrs Beatons! Good to read your updates. Sounds like you’re having fun! While Peter has been in the UK, I’ve been maddly redecorating the house – he won’t recognise the place when he gets home! Only a week to go and Mercedes is coming too. Clara is very excited – she’s been missing Daddy too much! Love to you both. Here are a couple of recipe ideas ripped straight of the net (no test kitchen here!). Guaranteed gluten free, one pot main meals. Good luck! Found this on another recipe website when I was searching for chickpea recipes. Love this – make it regularly and have passed it on to numerous friends and family. Is gluten-free if served on rice. Only requires 1 fresh ingredient (my basic criteria) and can be sized up and frozen with great success. It seems very similar to Ciao’s #66380 which I will have to try soon. Cut off the ends of the eggplant, than chop into ¾” cubes. I salted an eggplant once just for fun, but with fresh eggplant just don’t find it necessary! Coat a large deep-sided frypan with olive oil. and heat over a medium heat. Add the minced garlic, onion, chili powder, cumin and cinnamon. Stir well to coat evenly. Cook until the onions have softened (approx. 4-5 minutes). Add the eggplant, tomatoes and chickpeas, along with the stock. Simmer over medium-low heat, covered, for fifteen-twenty minutes (until the eggplant is tender). Uncover and stir. If the stew looks very soupy, let the liquid bubble away for a few more minutes. Serve over rice / pasta / cous cous / even toast would be yummy. The qty of spice listed make it moderately hot – good for a taste explosion for someone not used to spices. I normally double them as I like things really spicy! I make this when we have heaps of veges left in our weekly organic box, or no meat and only a spare tin of beans in the cupboard. I normally use pinto, cannellini or red kidney beans, although any beans will do. If I have spare tomatoes in the fridge they normally get chopped up and added to this as well. Heat the olive oil in a pot on top of the stove (medium heat), and saute the onions and garlic until the onions are translucent. Take care not to let them burn. Add the dried chillies, paprika & herbs, and stir to combine. Saute for 1 minute. Add the zucchini and red pepper, and saute for 3 minutes. Add the tins of tomatoes and tomato paste and stir to combine. Heat until bubbling/simmering gently. Mash half of the beans and add them along with the whole beans to the mix. Stir to combine, and put into the oven. Cook for 45-60 minutes, stirring every so often. Season to taste with salt and pepper, and serve with rice or mashed potatoes, or just with crusty bread.